Mix together flour, baking powder, and salt. Cut butter into flour mixture with a pastry blender. Add pork, cheese, and buttermilk. Bake at 400 degrees for 15-20 minutes or until light brown. I split one open at 15 and it was fully cooked through. When balls are done baking drain the pan. Remove to a paper towel so soak up a little more grease. Serve right away or at room temp. When I make them, I put a cooling rack on the pan and bake them like that. It keeps them from being so greasy. Just make sure to grease the rack or they will stick. 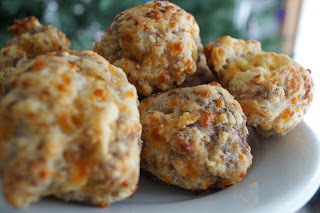 I love sausage meatballs and they sound easy and delicious. Stopping by from the Pin Junkie Party. They are, thanks for stopping! These look really good. I am on the look out for some great wheat-free recipes and I am so glad I found this! 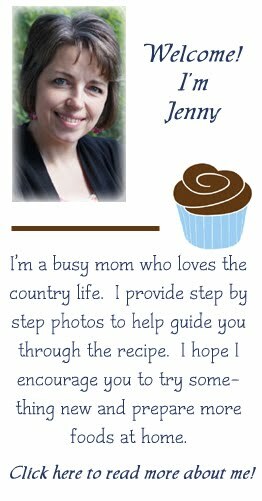 I would love if you could stop by my weekly recipe link up, Kids and a Mom in the Kitchen and share these! It's tough going GF so I am glad I found a flour I like. These look great Jenny! A perfect little appetizer for any party that will go great with drinks and other delicious things! Thanks for sharing!